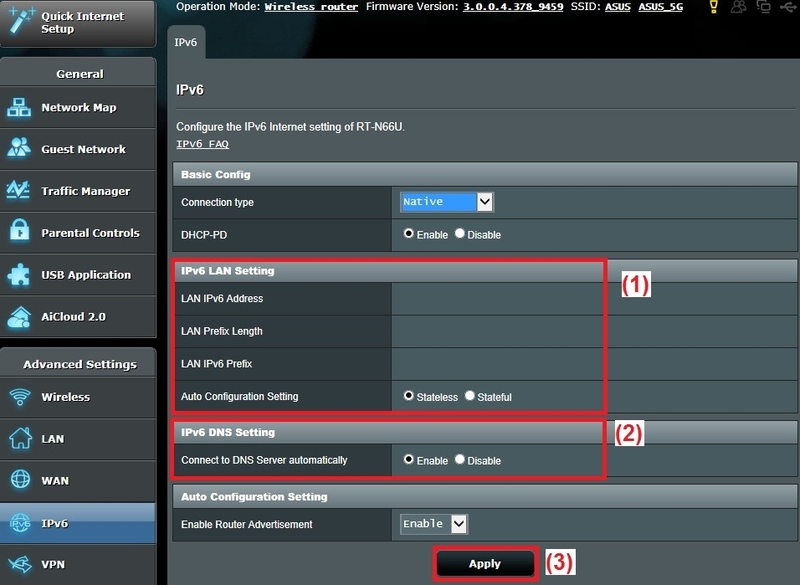 ASUSWRT supports “IPv6” after firmware version—“3.0.0.3.78”. 1. Please launch a browser and go to the setting page of router; the default website of ASUS router’s setting page is http://192.168.1.1or http:router.asus.com. (2) Select the “Connection type” according to your ISP. For other IPv6 types, please ask your ISP provider for setup information. 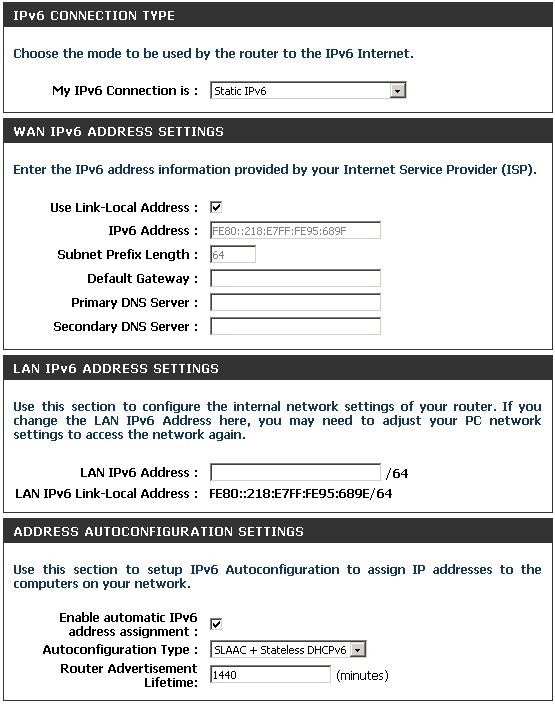 (1) Please use the information from your ISP to fill in “IPv6 Prefix”, “Prefix Length” and “IPv6 Gateway” under the “IPv6 LAN Setting” section. 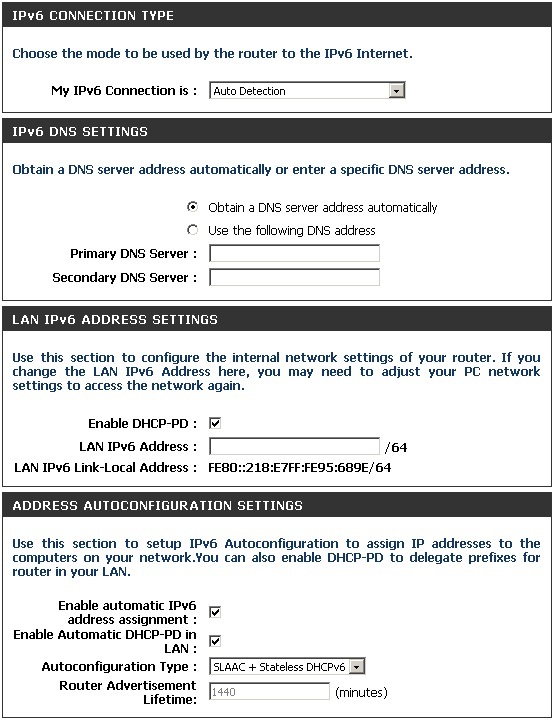 (2) Please use the information from your ISP to fill in “IPv6 DNS Server” under the “IPv6 DNS Setting” . (3) Click the “Apply” button and wait for the settings to finish updating. There are several connection types to choose from: Auto Detection, Static IPv6, Autoconfiguration (SLAAC/DHCPv6), PPPoE,IPv6 in IPv4 Tunnel, 6to4, 6rd, and Link-local. 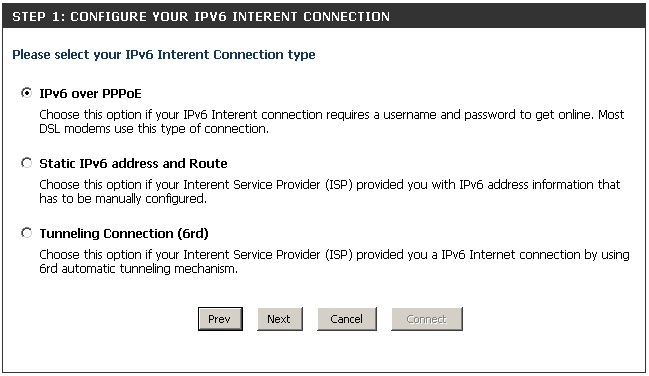 If you are unsure of your connection method, please contact your IPv6 Internet Service Provider. Note: If using the PPPoE option, you will need to ensure that any PPPoE client software on your computers has been removed or disabled. 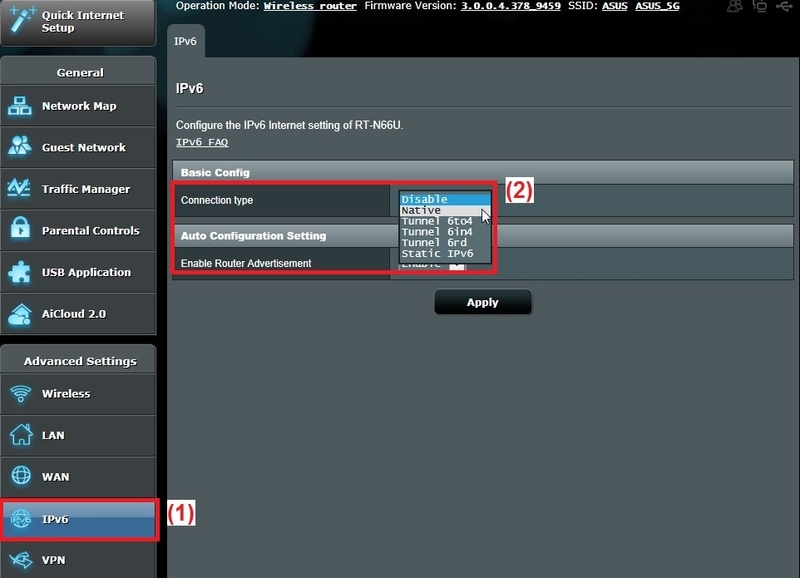 Select Auto Detection to have the router detect and automatically configure your IPv6 setting from your ISP. 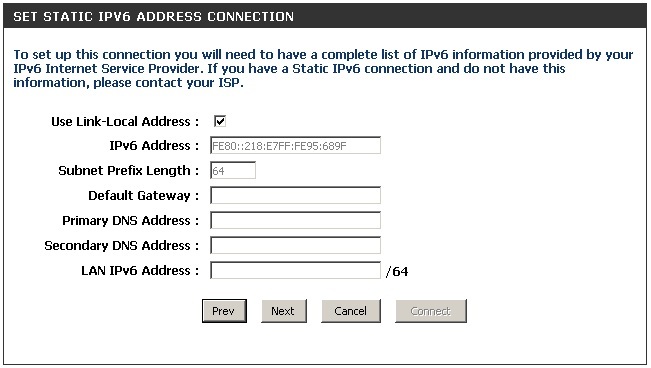 Select Static IPv6 from the drop-down menu. Enter the address settings supplied by your Internet provider (ISP). Enter the LAN (local) IPv6 address for the router. Displays the Router’s LAN Link-Local Address. Check to enable the Autoconfiguration feature. Select Stateful (DHCPv6), SLAAC + RDNSS or SLAAC + Stateless DHCPv6. Enter the start IPv6 Address for the DHCPv6 range for your local computers. Enter the end IPv6 Address for the DHCPv6 range for your local computers. Enter the IPv6 Address Lifetime (in minutes). Select Autoconfiguration (Stateless/DHCPv6) from the drop-down menu. Select either Obtain DNS server address automatically or Use the following DNS Address. Enter the primary and secondary DNS server addresses. your browser in a special format. Note: The following instructions and examples work with Microsoft Internet Explorer 7 (IE7) and might not work with other browsers. To connect to an IPv6 global address, add square brackets around the IPv6 address. For example, if the AP global IPv6 address is 2520::230:abff:fe00:2420, type the following address into the IE7 address field: http://[2520::230:abff:fe00:2420]. To connect to the iPv6 link local address, replace the colons (:) with hyphens (-), add the interface number preceded with an “s,” then add “.ipv6-literal.net.” For example, if the AP link local address is fe80::230:abff:fe00:2420, and the Windows interface is defined as “%6,” type the following address into the IE7 address field: http://fe80–230-abff-fe00-2420s6.ipv6-literal.net. The DHCP client on the UAP is enabled by default. If you connect the UAP to a network with a DHCP server, the AP automatically acquires an IP address. 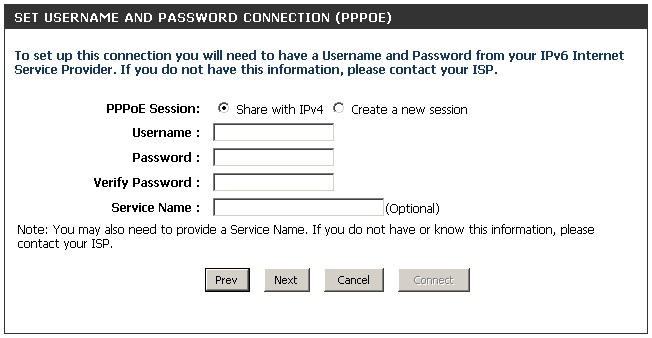 To manage the UAP by using the Administrator UI, you must enter the IP address of the access point into a Web browser. 1.) Using a null-modem cable, connect a VT100/ANSI terminal or a workstation to the console (serial) port. 3.) Press the return key, and a login prompt should appear.The login name is admin. The default password is admin. After a successful login, the screen shows the(Access Point Name)# prompt. 4.) At the login prompt, enter get management.Information similar to the following prints to the screen. The default Ethernet settings, which include DHCP and VLAN information, might not work for all networks.By default, the DHCP client on the UAP automatically broadcasts requests for network information. If you want to use a static IP address, you must disable the DHCP client and manually configure the IP address and other network information. The management VLAN is VLAN 1 by default. This VLAN is also the default untagged VLAN. If you already have a management VLAN configured on your network with a different VLAN ID, you must change the VLAN ID of the management VLAN on the access point. D-Link, the cost-effective, standards-based unified networking solutions provider for small- and medium-sized businesses, today launched its DGS-1500 SmartPro™ switch series, providing the essential features of a managed switch, including Layer 3 functions such as static routing, at a price point accessible to small- and medium-sized businesses. The SmartPro series allows businesses, educational institutes, and security companies to invest in their networks now, without having to worry about the future impact on IT budgets. Historically, small- to medium-sized businesses upgrading their switching environments have had to make a quantum leap in terms of investment and move to a fully managed switch if they required features such as VLANs and Static Routing. 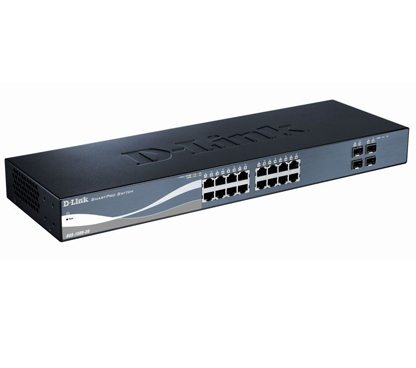 In order to provide a more gradual upgrade path, D-Link has introduced the DGS-1500 SmartPro series, allowing businesses to scale their switching infrastructure incrementally at a lower cost. In addition, D-Link’s SmartPro series enables centralized switch management through virtual stacking to provide businesses with a simple and cost effective means of managing networks of all sizes. The SmartPro series delivers advanced switching features that will benefit businesses by providing greater flexibility in how they configure their networks. The static routing functionality built into the SmartPro series enables businesses to segregate networks, which is ideal for isolating sensitive information. Previously, this feature was only available on high-end managed switches. Its time-based PoE and port scheduling functionality included with PoE models allows businesses to power down ports or the network when not in use, further reducing costs while increasing network security. The SmartPro series includes IPv4/v6 dual stack, IPv6 management, and meets phase two prerequisites of the IPv6 Ready Logo Program, providing a seamless transition from IPv4 to IPv6 services and helping customers to protect and future-proof network investments. The series also incorporates D-Link Green™ 3.0 technology, offering significant power reductions compared to similar switches on the market, helping businesses reduce costs and improve their carbon footprint. The DGS-1500 SmartPro Series will be available in April for $399.99 to $1139.99 MSRP through D-Link’s vast network of channel partners, including value-added resellers, solution providers and distributors.